Oh, that's too bad. I hope you can add it on the future. It's pretty essential if you do pixel art. In the Layers panel there's a cog icon to the right of the layer blend modes called 'Blend Ranges'. If you click on that and then click on 'Coverage Map' it gives you the ability to adjust anti-aliasing. Do any of the following settings do what you're looking to do? I just wanted to say that is one of the clearest, best presented explanations of a feature I have ever seen, at least as good as if not quite a bit better than anything I have seen in the built-in help topics. YES!!!! This is exactly what I wanted. Thank you so much!! edit: now that I've played with it for some hours, I gotta say, I still have problems when merging layers (they merge with antialiasing, except for sometimes in which they don't, and I really don't know what triggers it on/off), and sometimes just moving the object around will cause it get antialiased. Also it's rather tiring to have to set the blend option like that for all objects, instead of it being the default setting (I feel like there's an option for this though). Sorry for the double post, but just to be clear - the one constant remaining problem I have is that merging layers always anatialiases the layers involved. You can access Blend Ranges taping the ellipsis icon on the top of the Layers Studio - it's the two controls on bottom (Source and Dest). The Coverage Map control described above (for antialiasing) is not available on the iPad version. The Coverage Map control described above (for antialiasing) is not available on the iPad version. Are there any plans to add this feature to the iPad apps? You got to be kidding me. I just bought AP for iPad and currently testing the features. I was so happy that I finally got a decent Photoshop-level bitmap editing app for iPad, but this problem takes Affinity Photo from superb to useless for me. I'm dead serious! I always work without antialiasing, as it makes it much easier to transform and recolour, and because I hate blur and love sharp edges – in high as well as low resolution. But now I know that as soon as I transform anything, even if I just move a completely isolated bunch of pixels, it gets blurry = the whole picture is ruined. And there's nothing I can do about it. Affinity has SO many amazing features that no other iPad app has, but this 'little' issue flushes all of them down the drain and yet again makes Procreate the most useful drawing app for me, even with all the annoying flaws it has. I can't put in words how disappointed I am. Please, tell me that you are going to add the option for non-antialiased transformation or make ANY kind of update that fixes this issue. Tap the document menu on the top left of the interface (with a document open) then Snapping. Enable Force pixel alignment on the top of the right column and disable Move by whole pixels. This should force the pixels to remain aligned to the pixel grid when you move/transform a selection. Doesn’t that setting only affect movement, not transformation? What happens if you select a rectangle which is an odd number of pixels wide or high and you resize it from the centre by 150%? What happens if you rotate it by an arbitrary angle? As well as I could't find words for my disappointment just before, I now can't find words for my gratitude. THANK YOU!!! I am so amazed with Affinity, and now I can start using it for real! And a very fast response too. Please treat yourself with something nice, I suggest cheesecake and port wine. Is there a way to also rotate a selection without antialiasing? I can live without it, but it would certainly be a neat bonus. We can mark this thread as solved now, I think, if that's a thing in here? But maybe OP is the one to do so. 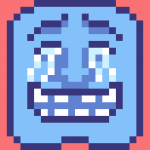 The blue man is now smiling and crying of happiness instead of sorrow. Yes you're right. I didn't think of resizing before, but neither that or rotation works. That's a shame, definitely a drawback. Even though movement is more important. I haven't tried exactly what you described, not sure why it has to be an odd number, but no matter how I resize or rotate, it gets antialiased. Edit: I see why you wanted it to be an odd number, sorry for not thinking. However, no matter what I do it seems to get antialiased, odd or not. Except for a tiny 5x5 figure – when rotating that 90º it's still sharp, but tried a much larger selection that got blurry when rotating 90º or 180º. It doesn’t have to be. That was just a general example. I was originally going to use the specific example of an object which is 30 pixels wide (where resizing from the centre by a factor of 150% would mean making it 45 px wide by adding 7.5 px to each side) but any initial value which is not an exact multiple of 4 will produce a similarly unsatisfactory result. Sure. When resizing, it seems to always blur. I tried resizing a selection of 94x84 (random number I know, but even) to the double (188x168), and it still got blurred. This selection (94x84) rotated nicely though, without antialiasing, when I rotated it 90º. Rotation also looks good when X and Y in the selection are both even. I said before that it had to do with the size of the selection, but it's probably just a question of even or odd. I'm not good at math, but I'm slowly getting it. A workaround for resizing could be to resize the whole file after duplicating it and then copying the parts you want to be larger into the smaller file. Though, this should only work if the size is doubled, and it's probably too awkward to do in a real situation. Sorry if I make it all seem unnecessarily complicated by not understanding completely. Hope it all makes sense. One more question: What happens if I don't disable "Move by whole pixels"? It seemed to work either way. The Force pixel alignment option only helps with moving/transforming objects/selections, ensuring integer values are used whenever possible. It doesn't disable antialiasing neither is supposed to be a solution for your issues, but should help in the cases you are trying to move things around (or transforming objects when applicable) preventing the blurring. Cases like Alfred mentioned are not covered/solved by force pixel alignment because you can't keep integer values without introducing some distortion. If you stretch or scale an object freely (without keeping the ratio) then force pixel alignment will ensure integer values are also used. Regarding you last question: Move by whole pixels does exactly what is says - it moves the objects/selection whole pixel increments. So if you object/selection is already on integer values they will be kept after you move the object/selection. Some thing in case the object/selection have decimal places/values - Move by whole pixels restricts the movement to integers values and so any existing decimal places will be kept after the object movement. This can be useful to work with sub-pixel objects/designs (icons, small text/objects that you optimize/work at a sub-pixel level)and still be able to move them without affecting their sub-pixel positioning. That’s what I originally thought, Miguel, but then it was pointed out to me that the ‘Move by whole pixels’ option is a child of the ‘Force pixel alignment’ option (so, in theory at least, it can’t be invoked separately). I’m very confused now! Rather than as a child option, rightly or wrongly I think of it as an alternate mode of forcing pixel alignments (to integer pixel increments or decrements). As such, it could have been implemented so it could invoked separately but I think they decided it would make more sense to make Force Pixel Alignment a switch with two 'sticky' modes. I never said i was an independent option (which should be obvious as you can't enable it without Force Pixel Alignment enabled both in the main toolbar and in the Snapping Manager). I was simply explaining what it does. If ‘Force pixel alignment’ ensures integer values, where do those decimal places come from? From the original object's position. Who said all objects must be pixel aligned? When working on small icons, optimising logos or text for small sizes (for use on webpages for example) you may want to keep some of the objects/paths/shapes that compose the logo/icon/design/whatever in sub-pixel positions. 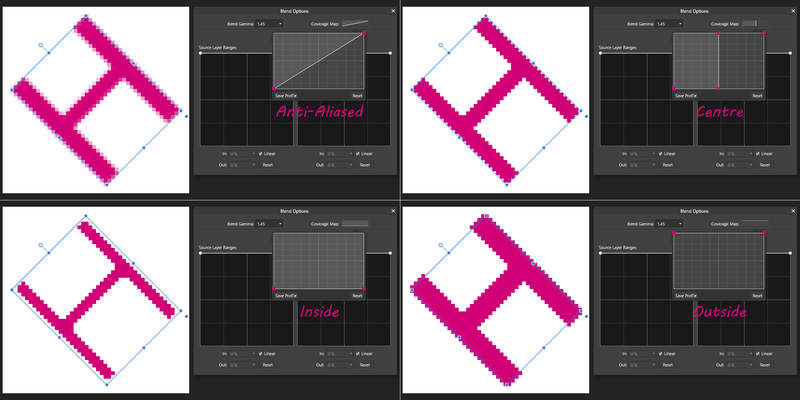 Force Pixel Alignment ensures objects will be pixel aligned but for those you want to keep at sub-pixel positions Move by whole pixels will ensure they keep they decimal places while still moving them whole full pixels.